After measuring the area to be updated, I take photographs to help me during the design process and serve as a reference. I then draw a Base Map and will draft one or two Preliminary Plans for your perusal. After feedback from you, I then complete a Final Plan which graphically depicts the layout of your space along with the plant material and hardscapes. I will include a listing of all the new plant material with both scientific names and common names, sizes of the containers and any special notes that may be important to the choice of specific plants. For future reference, I will present an Identification Notebook with color photos of each plant along with information pertaining to your plants’ growth habits and care. During the installation period, whether you prefer to do the work yourself or use a contractor, I will be available to assist with the plant layout and liaison with the contractor and crew. This enables adherence to the plan while accommodating fluctuations in plant availability and other last-minute changes. I am also available to assist or advise on pruning and other ongoing maintenance. If you need assistance to install your custom design, I can refer you to a suitable licensed landscape contractor. 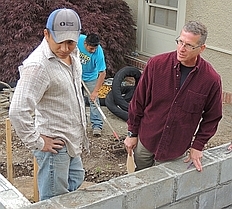 This person will work with you to choose specific materials for the hardscape elements and construct any desired gazebos, fences and retaining walls. You may simply desire advice on updating or refreshing certain areas of your property. 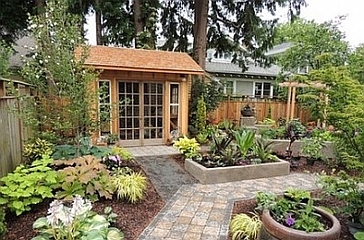 I can accompany you on a walk-through and offer ideas for selective removal or relocation of plants, recommend additional shrubs or perennials, and suggest ways to more fully enjoy your garden space. 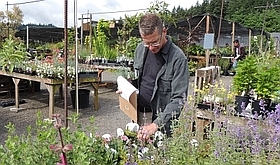 I can personally accompany you to local specialty nurseries to help find appropriate or unique trees, shrubs and perennials for each area of your yard. If you are unable to come along, I can procure the plants and arrange for their delivery. This service is billed at an affordable hourly rate. 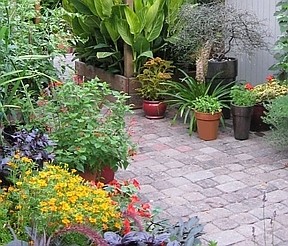 Every yard can be enhanced by custom container plantings. Using your existing containers or sourcing from a wide variety of new pots and planters, I will design plantings to best complement your individual tastes and garden style. Whether you desire colorful seasonal annuals, year-round interest, or unique mixed plantings, I can bring you the latest in plant varieties and container trends. Please note that each yard varies–some work can be fairly straightforward while other situations involve significant time, thought and planning. It is best to consult with me on the pricing structure for your project.